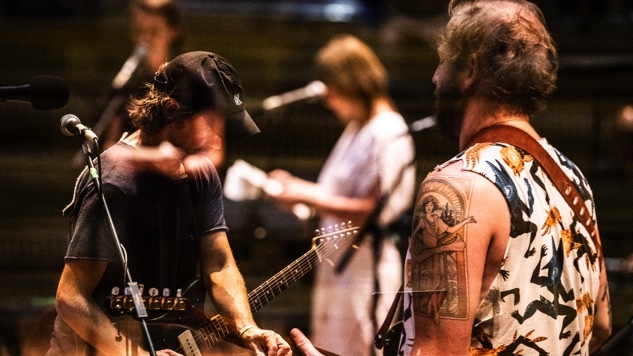 Bon Iver’s Justin Vernon and The National’s Aaron Dessner have reached the end of a decade-long road today, Aug. 31, with the release of their self-titled debut album as Big Red Machine. The super-duo’s 10-track LP is now streaming via both their free digital platform PEOPLE and traditional streaming services, and is available on vinyl, cassette and CD in partnership with Jagjaguwar. To celebrate the album’s unveiling, Vernon and Dessner have also shared a series of music videos (dir. Eric Timothy Carlson and Aaron Anderson), giving three Big Red Machine tracks—“Gratitude,” “Forest Green” and “I Won’t Run From It”—the visual treatment. The low-tech, collage-like videos display each song’s lyrics and production credits alongside mesmerizing visualizers, peaceful live-action footage and stray text, reflecting each track’s hypnotic flow while retaining a distinctly organic aura. Stream Big Red Machine here and watch the duo’s new video series below. Keep scrolling for throwback Bon Iver and The National performances from the Paste archives. You can find out more about PEOPLE here.